In less than one month I’ll be flying from Boston to San Diego to begin my hike north from Mexico to Canada on the Pacific Crest Trail. My gear setup is finally coming together, but regardless, I keep checking the PCT Class of 2017 Facebook group like a mad woman trying to find something I could have missed, where I could go lighter, etc. The stress I’ve caused myself counting ounces and checking out other peoples gear lists is no doubt counterintuitive of why I am choosing to live on the trail for four months, so I decided to take a step back from that. Instead, I sought out advice from the three people who know me best at this point; the 7, 5, and 3 year olds I nanny for 40+ hours a week. Here are their thoughts on what I should be bringing on my long walk. A Saw (to cut down trees to get the nuts) – Marky, age 5. He was certain he learned about this at his pre-school. All nuts grow on trees in the desert, and that means free food, Maya!! Regardless, I should probably go over the LNT principles with this one. Water!!!!! (as much fits) – Cassandra, age 7. That’s my girl, the realist. Camera (or I will be “vaery” mad at you) – Cassandra. Phone – Sawyer, age 3. No. Plain Milk – Sawyer. A “Shuvl” (for snow) – Cassandra. ^ (and dinosaur bones) – Sawyer. Snow Pants (for jumping in) – Marky. You hear that folks? Ditch the micro spikes and ice axes this season for the real Sierra survival essentials. Ultralight is so last year anyways. Jumping on the Euroschirm bandwagon, eh? 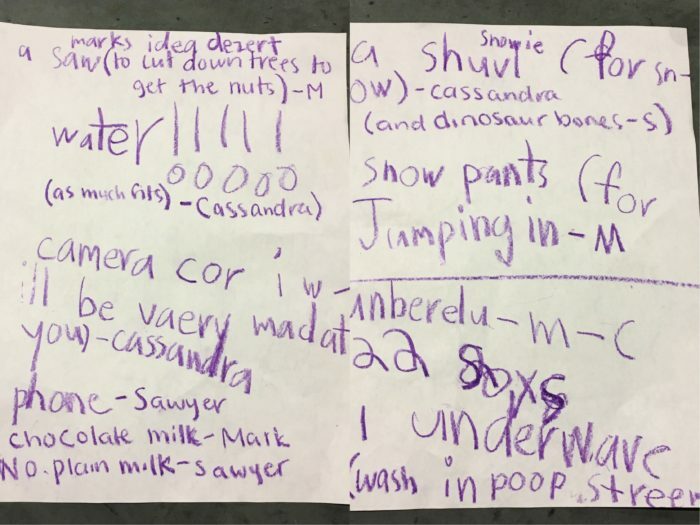 1 Underware (wash in poop streem) – Cassandra. She thought this was hilarious. I’m not sure about the poop stream, but the quantity is accurate. There you have it! 12 items every prospective PCT thru-hiker *must* bring with them, as told by the 3, 5, and 7 year old children I spend way too much time with. The original purple crayon copy is pictured below. You can’t make this stuff up, people. All joking aside, your gear list doesn’t have to be perfect pre-hike. You will inevitably switch things out, send things home, and add things as necessary along the way. Use what you already have, take only what you need, and the trail will provide. Yasss. Love it. So adorable.